Many people enjoy the luxury of being able to flip a switch and “turn on” their fireplace when the weather gets chilly. Just like any other appliance in your home, your gas fireplace is prone to damage, and it’s possible to run into instances when you need to have your gas fireplace repaired or replaced. Repairing a gas fireplace can be a challenge because often it’s difficult to find the source of the issue. There are a multitude of parts working together, and when your gas fireplace needs to be repaired, there could be a multitude of factors contributing to a single issue. Not to mention working with gas and gas appliances is dangerous for someone who is not an expert. It is not recommended that you fix problems with your gas appliances yourself. If your home begins to smell of gas and you cannot determine the cause, call an expert for help right away. 1st Choice Chimney is committed to making sure your gas fireplace is working properly, and you’re able to enjoy your fireplace hassle-free. 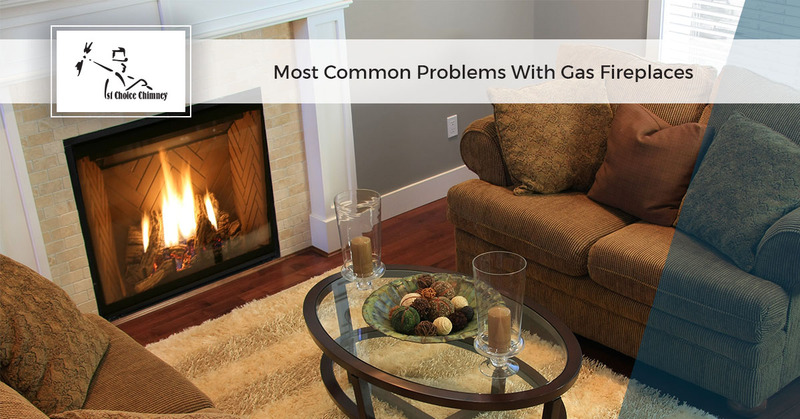 In this blog, we’ll outline the most common issues with gas fireplaces and when it is appropriate to call your local gas fireplace expert. If you smell gas, or there is no ignition, this indicates a problem with your gas fireplace that you should not try to fix on your own. It’s easy to smell natural gas because of its distinctive “rotten eggs” smell. If you look at the piping underneath and see any obstructions, they can cause little or no flow of gas. This will not turn on your gas fireplace, and can lead to gas leaks. If you smell the odor, immediately deactivate the valve, vent your home, and call your local gas fireplace specialist. In addition to piping problems, the natural gas smell can be caused by dust, pet dander and dirt that gets inside the burner or other fireplace components. Gas leaks are also caused by the glass on your fireplace door not being properly sealed. If the smell of gas is strong, call the fire department and your gas provider immediately, and evacuate your home. In many kinds of gas fireplaces, the system won’t require any electricity to light. However, the pilot light going out will cause the fireplace to stop igniting. If this happens, you can easily relight it. However, if the flame reignites but the pilot light won’t stay on, this indicates more complex problems, that an expert should investigate. For example, if you hear a roaring sound only when the pilot light is on, that means that the flame is not properly adjusted. The thermocouple is in older systems and is a simple metal rod between the gas valve and burning pilot flame. When the gas needs to be ignited, the thermocouple is the part responsible. If it is the source of the problem, it may need to be repositioned or replaced. Because it interacts with all the other components, it has a big impact on your gas fireplace for better or for worse. The thermopile is a modern type of sensor that generates the voltage necessary to ignite the natural gas. If you have a sluggish burner, or if it does not ignite at all, your thermopile most likely is not providing enough electricity to ignite, and there may be an issue with the wiring. Loose wiring, wiring of insufficient size, or damaged wiring may be the culprit. Soot is an indicator of problems in your gas fireplace. It is a product of unburned fuel, and unvented gas fireplaces should never produce soot. If your unvented gas fireplace does, it’s important to have your fireplace checked by a professional. Potential solutions to excess soot are too much fuel mixed with too little oxygen, adjusting your damper to create the proper draft, making sure your chimney is not obstructed, making sure the combustion screen is free of soot, and making sure embers and logs are aligned according to their instructions. 1st Choice Chimney is your trusted local gas fireplace repair service. We are proud to be veteran owned, and committed to excellence. Contact us today for the highest quality gas fireplace repair and replacement services in the Dallas, Fort-Worth area.